The business community has long complained that the 35 percent top corporate tax is the highest in the world and has placed them at a distinct competitive disadvantage. Yet many entrepreneurs have sharply reduced their tax obligation over the past decade or two by changing their corporate structure to “pass-through” entities that enable them to pay a much lower tax rate under the federal personal income tax code. This little known but highly significant shift towards pass throughs, such as sole proprietorships, Limited Liability Companies (LLCs), partnerships, and S-corporations, has profoundly diminished the flow of tax revenue into the Treasury’s coffers. The surge in pass-throughs cost the Treasury at least $100 billion in foregone revenue between the 1980s and 2011, according to government figures, and experts say that the price tag will grow substantially in the future. Moreover, the Treasury Department and the National Bureau of Economic Research warned in a paper presented last year that partnerships and other pass-throughs have widened the income gap in the country, as the Fiscal Times reported. Pass-throughs allow for generous tax breaks to and deductions. This has enabled the wealthiest Americans to nearly double their share of overall income between 1980 and 2013, the study asserts. So it is notable that Donald Trump, the billionaire businessman and Republican presidential nominee, has proposed to reduce taxes on pass-through income even more as part of a retooled economic plan he unveiled in Detroit earlier this week. Trump’s proposal, if enacted by Congress, would set the tax rate on pass-through income at a maximum of 15 percent, compared with the nearly 40 percent personal income tax rate that wealthy businesses must pay today. At the same time, he would lower the top corporate tax rate from 35 percent to 15 percent. After deductions, the average income tax rate on U.S. pass-through businesses in recent years was just 19 percent, according to the Treasury, much lower than the average rate for traditional “C” corporations, even after deductions are claimed. A study by the Center for American Progress released this week found that 70 percent of pass-through income goes to the financial industry and profitable holding companies. 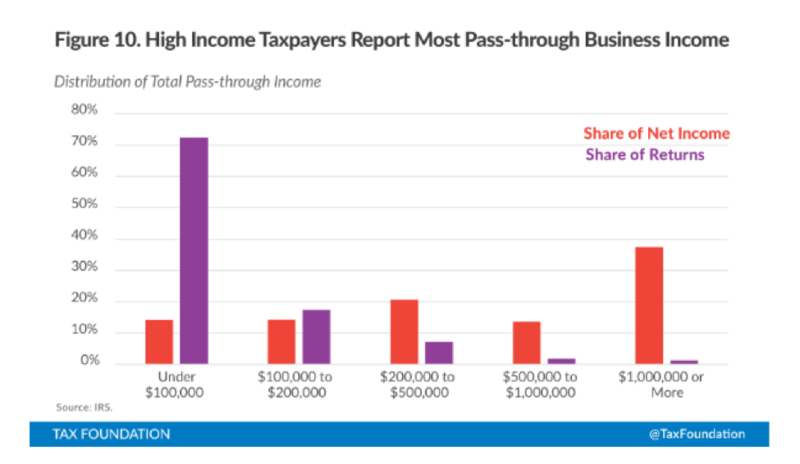 While other Republican presidential candidates over the years have proposed lowering the top personal income tax rate in order to effectively lower the top pass through rates, Trump is the first to target businesses large and small for major pass-through tax relief. What’s more, Trump’s own real estate and resort businesses interests would benefit substantially, as The Washington Post reported Wednesday. The real estate mogul listed on his 2015 presidential financial disclosure form holdings of more than 200 LLCs (limited liability corporations), which are a form of pass throughs. However, critics caution that the proposal could provide new incentives for tax evasion or “gaming” the tax code by wealthy Americans and businesses and a further diminution of tax revenue that could put added pressure on the deficit. “The IRS would have to be extremely careful in setting the rules to prevent any sort of gaming of wage or business income,” Scott Hodge, president of the non-partisan Tax Foundation, said in an interview today. Today, there are an estimated 25 million to 30 million sole proprietorships established by lower income business people and entrepreneurs, and about seven million S-Corps and Limited Liability Corporations created by high-income doctors, lawyers, consultants, manufacturers, and others. Hodge said that currently, the Internal Revenue Service has a “reasonableness test” for S-Corps designed to prevent wealthy business people and others from reporting only a small portion of their income as taxable wages and taking the rest as dividend payouts.